The Job Seeker Journey & Enjoyment of Employment programme has many delivery options ranging from 1 day to 3 days and is a great introductory course or refresher course to people who are unemployed. It provides them with practical skills in a highly interactive, engaging, fun environment and covers what it would be like to be in employment, what benefits it would give them, socially, financially, personally and also what skills they can offer to employers. Using coaching and recruitment case studies this unique seminar helps people get focused on working towards the Enjoyment of Employment. The programme can also be used as an introduction to Accredited or other Employability programmes you are running. A copy of our Leave Unemployment Handbook can be included in the programme as an optional extra. The Job seeker Journey focuses people on the 3 critical elements to becoming employed and getting participants to a “Work-Life Balance” Lifestyle quickly. 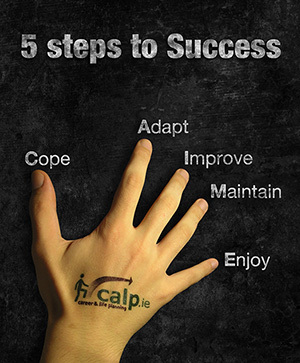 This seminar uses the Coaching Methodology “5 Steps to Success” which helps manage change better, and leads to a focus not only on employment, but on getting closer to enjoyment, personally and professionally.